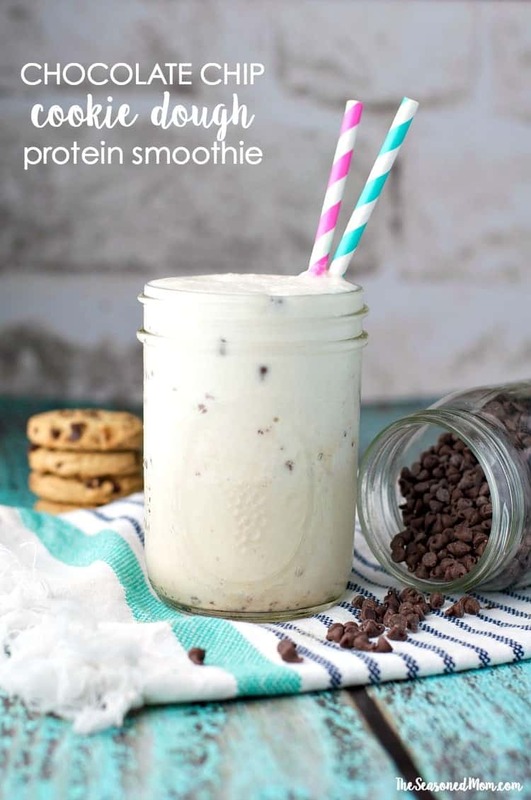 A healthy and delicious chocolate chip cookie dough smoothie filled with protein and the perfect way to start the day! Low calorie and delicious! A healthy Chocolate Chip Cookie Dough Smoothie is the perfect way to fuel your next workout or power through your day! With all of the rich and buttery taste of your favorite dessert, this low calorie protein shake is a nutritious breakfast or snack recipe that will satisfy your cravings and keep your tastebuds happy! Ahhh…there is seriously nothing better than a cool, creamy, and chocolatey frozen drink to cool off on a hot summer day! Better yet if it tastes like cookie dough and it’s so thick that you need to eat it with a spoon! The Secret To Making A Healthy Cookie Dough Smoothie! First, the almondmilk! 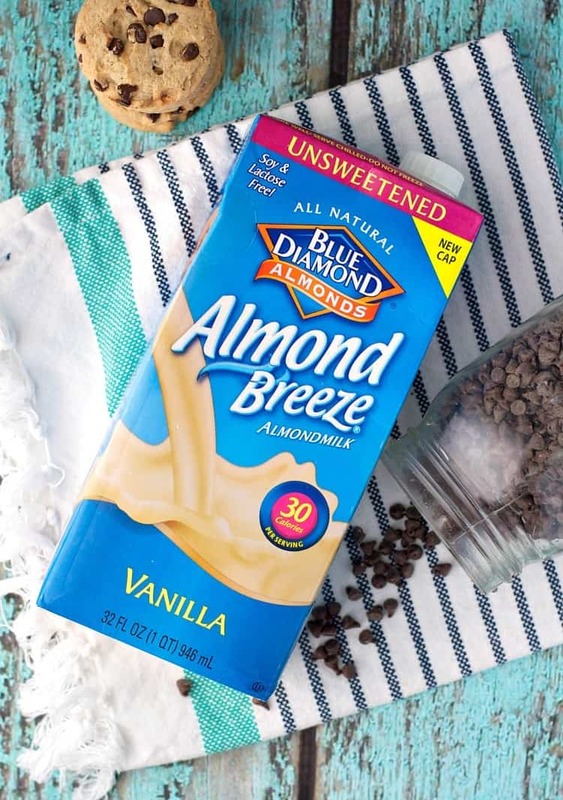 My go-to base for any smoothie is Almond Breeze Unsweetened Vanilla Almondmilk because it adds a creamy texture with a hint of vanilla flavor…for only 30 calories per serving. And I’m not the only one who think this beverage is great! Almond Breeze has partnered with Team USA Volleyball to help fuel the elite athletes through some of their most grueling summer workouts. A hot, sunny, and sandy beach session = a mandatory protein-packed SMOOTHIE! 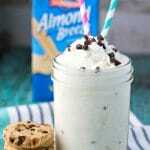 How To Make A Cookie Dough Smoothie Packed With Flavour! But this isn’t just any smoothie. 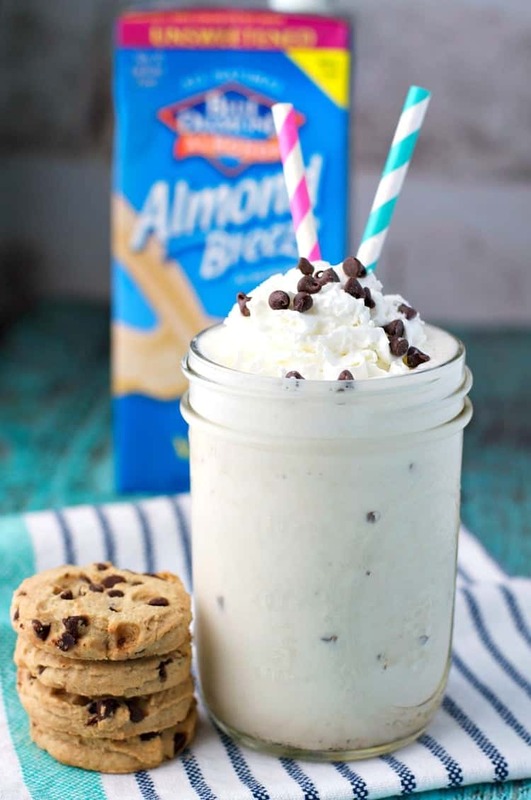 Part-milkshake and part-cookie, this high protein shake is the best of all worlds! My other two secrets for a cookie-like shake are raw oats and butter flavoring! That’s right — raw oats are pureed right into the drink, giving it a thicker, chewier, and more dough-like consistency. Plus, the addition of whole grains gives the smoothie more staying power to keep energy levels high and cravings at bay! The Butter Flavor, which can be found near the vanilla extract on the baking aisle of your grocery store, gives the smoothie that rich, buttery taste that you would expect in a traditional cookie. 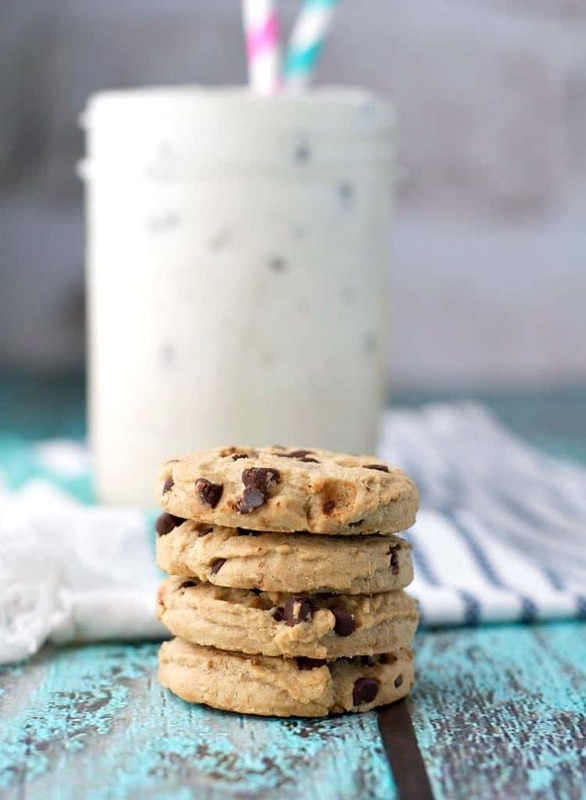 Paired with the vanilla-flavored almondmilk and the bits of chocolate chip throughout, you can trust me when I say that this is truly a tasty way to start (or end) your day — guilt free! 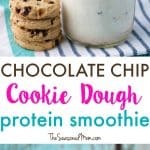 If you’ve tried this Chocolate Chip Cookie Dough Smoothie or any other recipe on The Seasoned Mom then don’t forget to rate the recipe and leave me a comment below! You can also follow me on Facebook, Twitter, Instagram and Pinterest to see what I’m getting up to. Did you try this recipe? Don’t forget to rate it and leave me a comment below! You can follow me on Facebook, on Instagram, on Pinterest, and on Twitter! Place first 7 ingredients (almondmilk through salt) in blender and puree until smooth. Add 1 teaspoon of chocolate chips and mix just until combined. Pour into a glass and garnish with additional 1 teaspoon of chocolate chips and optional whipped topping! This post is sponsored by Blue Diamond Almond Breeze Almondmilk. Almond Breeze believes in the best. That’s why we only use Blue Diamond Almonds to make our almondmilk and why we’re proud to be an official sponsor of USA Volleyball. Visit www.ServeUpYourBest.com for a chance to win $5,000 for the ultimate beach day, learn fun volleyball moves, get Almond Breeze coupons and smoothie recipes! Thanks, Wajeeha! You can never go wrong by starting the day with chocolate! Thanks so much, Bethany! A little bit of cookie dough in the form of a frozen treat never hurts! I agree, Shadi! This time of year has me craving smoothies in the morning even more than usual. I even have them for afternoon snacks sometimes when it’s HOT and I need something refreshing. Always does the trick! Now this is my kind of smoothie! Such a great idea to add in a cookie flavor, Blair! Sounds like dessert, but is healthy…love it! I have a feeling this would quickly become my favorite drink! Thanks, Gayle — mine too! Can’t go wrong with cookie dough…in any form! I add a handful of spinach, 1 tablespoon of chia seeds and 3-4 tiny carrots to get my veggies in without tasting them. I have a mental aversion to vegetables but my Dr. says I need to eat them. This is a match made in heaven. Thank you ma’am for helping me on my way to eating healthier. Made tonigh! I use a little more almond than called for, yummy!